Remove protective cap and insert cartridge into your printer. Your printer/computer may display ink alert messages, such as “remaining ink cannot be correctly detected”. Press “OK”, “Yes” or “Close” to dismiss alert prompts, or press “OK” on the printer. NOTE 1: “Empty” and “Low Ink” alerts are COMPLETELY NORMAL for all Canon 270, 271, 270XL, 271XL ink cartridges which have been refilled! While at first this may be an unusual workflow, it does allow print operations to proceed. After refills, the printer cannot track the ink level; ink level indicator will falsely signal empty. If ‘Support Code: 1600/1689/1700’ alert messages are displayed or the low ink indicator blinks and stops printing. PRESS AND HOLD the “STOP” or “STOP/RESUME” button (down arrow/triangle-circle) on your printer, for 5-8 seconds, until the low ink indicator goes out and printing resumes. Refer to pictures below. For many of the newer Canon MX & MG printer models, you will need to hold two buttons down – not just the stop button. You need to PRESS AND HOLD the COLOR and STOP/RESUME buttons down for 5-8 seconds to reset the printer….this will enable the refilled ink cartridges to function. DO NOT select “Cancel Printing” if prompted by computer. 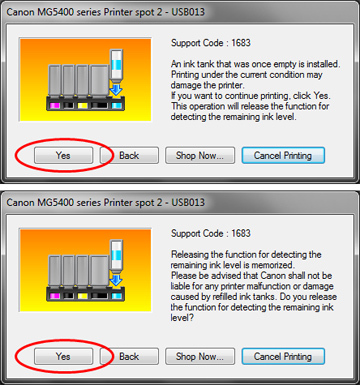 Ignore printer ‘damage’ or ‘malfunction’ warning prompts; select ‘Yes’ to release the function to detect remaining ink level and continue printing. Continue to print until the print quality fades; various nuisance messages may appear at random when using refilled cartridges. NOTE 2: If the printer is allowing copies to be made, it should mean that the tanks are not at the “ink out” level that requires the clearing of the ink level indicator by holding down the Stop/Resume button. NOTE 3: Received faxes which are stored to memory will not be printed – though you can manually print out any fax contained within memory. You can change this setting to forcibly print all incoming faxes. 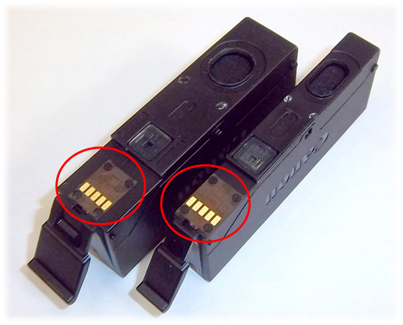 1) Remove cartridge from printer and thoroughly clean gold contacts of cartridge chip (pictured below). 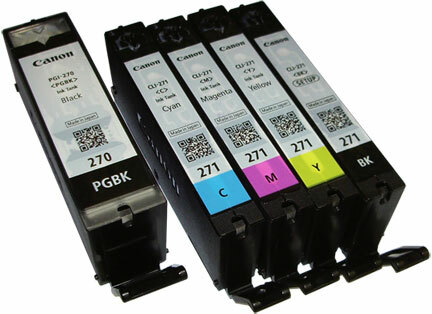 You will need to ensure the Canon 271BK /271XL BK BK (photo black) ink cartridge is really empty before bringing in for refilling, otherwise the cartridge may be ‘rejected’ by your refiller. Photo Black is only used when printing photos so this color will typically last much longer than the other colors. If the cartridge is not completely empty, an accidental overflow of the photo black ink cartridge may occur during refilling. 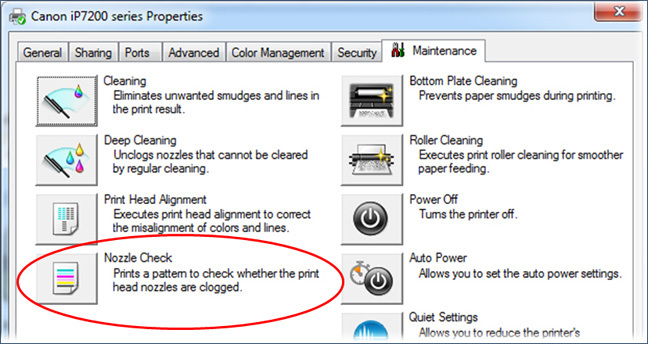 Under the printer’s Maintenance menu, activate the internal self-test print (i.e. Nozzle Check) to verify which color, or colors, are missing. 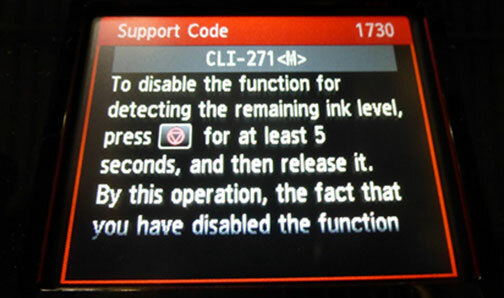 NOTE 4: Canon does not allow an automatic reset of the electronic chip on the cartridge after a refill, so the ink level indicator is sending a false message that the ink level is low. Your cartridge is not low on ink, and nothing is wrong with your printer or cartridges. The ink level indicator usually cannot be manually re-set, so the ink level indicator is often not usable. However, losing this feature is not necessarily significant, because the ink level indicator usually has substantial usable ink remaining when it shows “low on ink”. Ink level monitoring is primarily for planning purposes only – it is not required to support printing. *Typically the Canon PRINTHEAD (which is customer replaceable) should not reach it’s end-of-life until after a minimum of 10 or more complete sets of cartridge changes. While some printheads may last 15,000+ pages others may only last 3000 pages, actual results will vary. The printhead will eventually fail in time from an internal micro-electronics failure due to the following leading factors: general customer print usage and printer care, printer duty cycle (i.e. # pages printed per month), printing frequency (i.e. time between each print job), print mode (i.e. draft vs. normal) and content printed (i.e. photos vs plain pages) and color mode (black and white only vs. color/grayscale printing). Paper types used (i.e. plain paper, photo papers & matte/heavy bond papers) and paper edge curl (due to age in printer or low relative humidity) can also quickly lead to premature printhead failures due to physical ‘head strikes’ of the paper edges making repeated contact with the printhead nozzle plate.